Please direct your attention to the photo below. 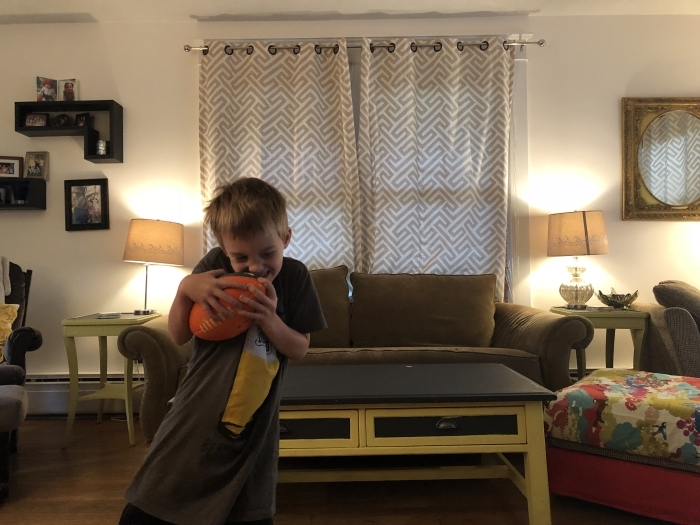 Moments after this image of my 6-year-old, indoor-football-playing son was taken, the Hudson Beach Glass bowl on an end table encountered a near-death experience when my younger son inched his way toward the hand-cast bowl to drop it behind the chair. But what I really wanted you to notice are the lamps. They used to match. Like a good Highlights puzzle, can you tell the difference? One lamp has a glass globe; the other does not. It did, until it got pulled from the table to the floor. No one was hurt, but my best clearance find — $14.95 each at the annual Cracker Barrel holiday sale — has begun its demise. On the bright side, it means I can keep my eye out for another deal. Hence the title of this column. I am a trash picker and clearance-rack junkie. I’m selective, but most of what we own came from the curb or had a yellow or red sticker on it. I have my standards. I don’t accept all hand-me-downs or inherited items. My belief is: you have to feel that furniture. It needs to be you. My parents are furniture absorbers. They absorb it, store it, and then try to store it with me. I’ve taken some. There are three sets of living room chairs in my attic, and they are all at risk of being covered in furniture paint. Don’t send it my way if you don’t want it covered! Highlands residents may not realize that they have Main Street access to the best furniture paint — in the world — in Beacon. It’s the Annie Sloan “chalk paint” carried in Knot Too Shabby. Knock-offs don’t compare. Few shops stock it. After Beacon, the nearest store is 30 miles away in Kent. If you collect furniture as it comes your way, it won’t match. Solution? Put some paint on it! Annie Sloan paint will cover anything. 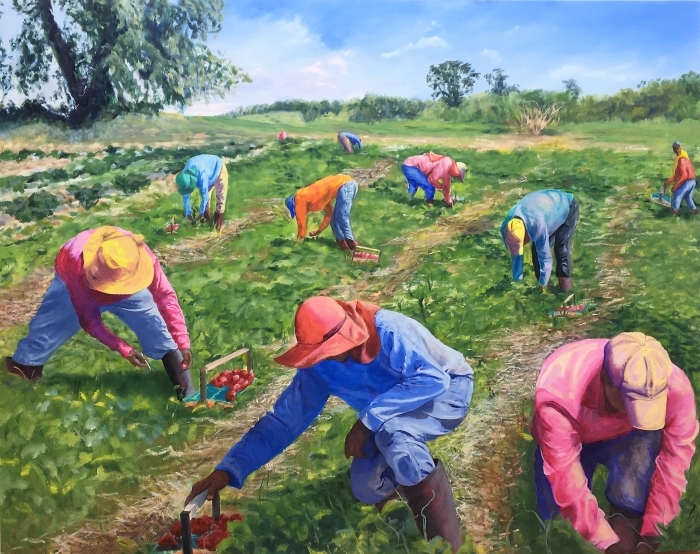 If you don’t like the color, it’s easy to paint it again. The new matching colors will add cohesion to your life, and maybe a little inspiration. Another life hack I’ve learned is to have certain bags for certain things. The swimming bag has goggles because goggles get lost. The diaper bag has diapers, wipes and a change of clothes. For my third child, the diaper bag has become the changing station. There is no changing station. Just the bag. What do you do with all of these bags? You hang them on hooks. Does it look cheesy? Not if you have cute hooks! I found a six-pack of faux pewter feather hooks at Target that look just like my very real and very special, hand-fabricated Kit Burke-Smith earrings. Ever since I challenged myself to learn how to use a power drill, there are hooks all over the walls. A hook for my husband’s belts (he has, like, 20 scattered everywhere). A hook for the kids’ backpacks. A guitar hook from Main Street Music. If your bags are part of the room decor, you know what that means — they gotta look good. That means the My Little Pony bag for swimming and the multi-pocket canvas hiking backpack for the diapers. Cheap upgrades with a big “wow” effect have been to lighting. I got the nicest light I ever bought three years ago on serious clearance from Niche Modern: $80 at its semi-annual factory sale (the sale runs again this weekend). It has been in our attic ever since. One day when I thought the fuse for the washer and dryer broke, I called the electrician. Of course, nothing was wrong. “Got anything else we can fix?” he asked. Sure! Might as well replace the rusted metal light in the bathroom with the glass-blown one I have sitting in the attic, instead of not fixing a boring fuse! And there you have it. Permission granted to make cheap upgrades with a “wow” factor for an otherwise destructible house.